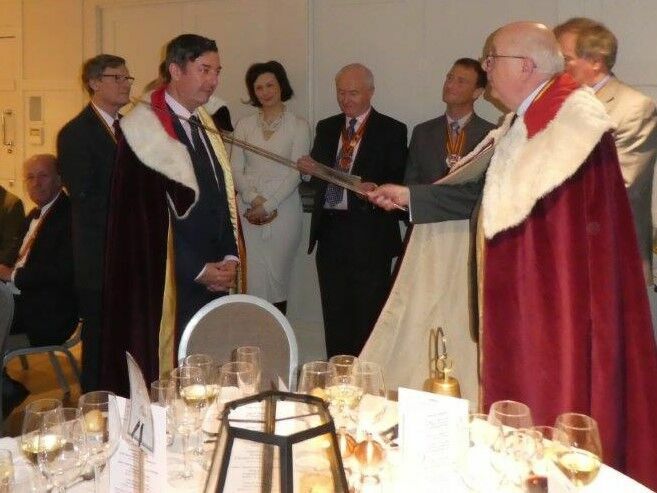 The Commanderie had an excellent evening at the Great John Street Hotel in late January. The reception was as good as ever, in an intimate atmosphere and with a lovely view of the Terrace Garden. Importantly, the Heidsieck Monopole also went down well! We were also able to welcome Mark Nolan to an exciting intronization held in a new venue. The first course of seared scallops, celeriac and truffle puree, watercress and hazelnut oil was beautifully plated and well-cooked and the flavours melded with the Clos des Lunes," Lune d'Argent" 2012, A.O.C. Bordeaux (which also made a good aperitif). The main course of ballotine and stuffed guinea fowl supreme, wild mushroom, colcannon and roasted carrot did not disappoint and proved to go well with the Château Langoa-Barton 2007, 3ième Cru Classé A.O.C. St-Julien 2007; it had dark plum colour with some black cherries and smoky wood on the nose, though a little closed on the palate and not complex. However, all the components were well integrated (although some people thought it a little tannic). The Organic cheese selection, including some Leagram soft organic Lancashire was well presented and although the Château Lacoste-Borie 2009, A.O.C. Pauillac,was a very pleasant wine, it was found that the fruit took some time to develop in the glass. The dessert of passion fruit and mango delight, coconut whip, and chocolate biscuits was enjoyed (even by non-coconut fans) and the Château Raymond-Lafon, A.O.C Sauternes went very well with it and had a bouquet of honey, melon and lemon which followed through on the palate with good acidity in the finish. The petite fours were also very well liked with the coffee and we were able to thank the chef and the serving staff in the normal manner by the Maître for providing excellent food and service.